Story starts with Maury Pigott who was an executive at American National Can. An environmental movement called “Ban The Can” had gained momentum in the early 1980’s. This was around the same time that the First Earth Day was celebrated. Maury had an idea to relieve some of the pressure on ANC from environmental groups. The idea was to replace their wood pallets with plastic pallets that would last much longer and would be fully recyclable. However, the plastic pallet barely existed at that time. He was joined by his 3 sons, Peter, Brandon, and Schylar and formed Nucon Corp., one of the first plastic pallet companies. The only technology currently employed to manufacture plastic pallets was high pressure straight injection molding. Nucon engaged the help of a Portuguese mold making firm to build a 3 piece pallet. The idea was to make a pallet that was both customizable and repairable. The corner posts are the most damaged part of a pallet but theirs was to be repairable by replacing the inexpensive damaged post. This could be done on the fly by the customer with Nucon’s patented “Magic Wedge”. Nucon eventually gave up on their first concept because the pallet was too heavy, too expensive, and not stiff enough. The 1M+ investment the family had made was a total loss. However, necessity is the mother of all invention and a new technology was employed. Low pressure injection foam molding. Traditionally found in the playground equipment industry, it provides a cellular foam core and solid skin that increases strength while reducing weight and material. 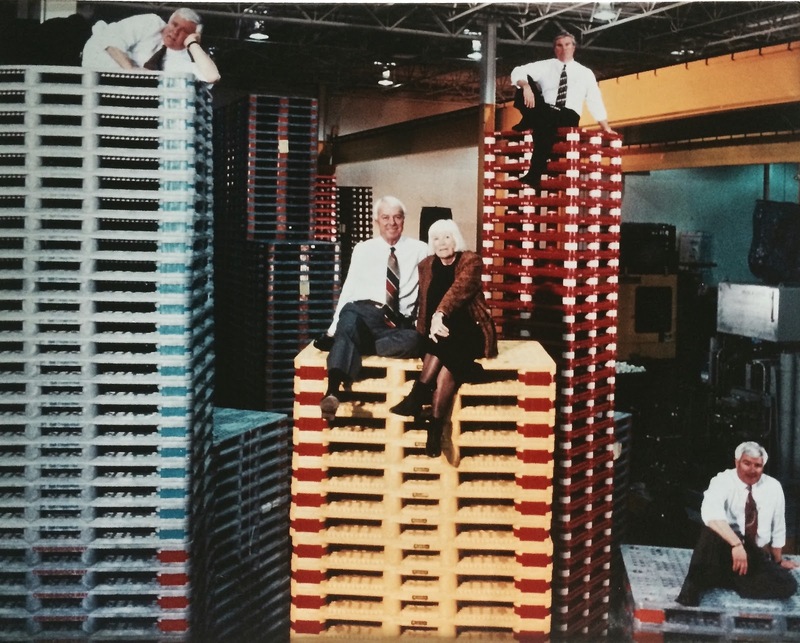 The only problem was that very few people in the world knew how to mold injection foam molded parts and the Pigott family was not one of them. They decided to outsource the molding of these foam molded pallets to a number of custom molders in the midwest. This formula worked but the hard part was convincing a stubborn industry to take a chance on a product that hadn’t changed in 50 years and was also much more expensive. Nucon positioned itself as an environmentally cleaner alternative than wood. Plastic pallets can last 10 years or more, whereas wood pallets sometime only last one trip. They were also able to use recycled plastic in some products which had the added benefit of being cheaper than virgin resin. However, the numbers talked through the use of a simple ROI. All other considerations aside, when you pit plastic against wood in a closed loop system, plastic wins every time. Even so, the large upfront cost was considerable at a time when businesses were cash hungry. 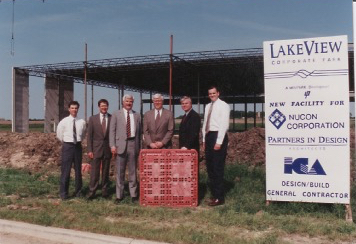 Nucon’s core business was the canning business which uses the 44x56 pallet size. Top canning customers were American National Can (now Rexam), Ball, and Crown Cork & Seal. Since the pallets were coming from the canning plants going to the filling plants, Nucon had their foot in the door with the beverage fillers. Filled cans use the 36x36 and 37x37 pallet sizes for the most part. The largest customer for these sizes was CocaCola. 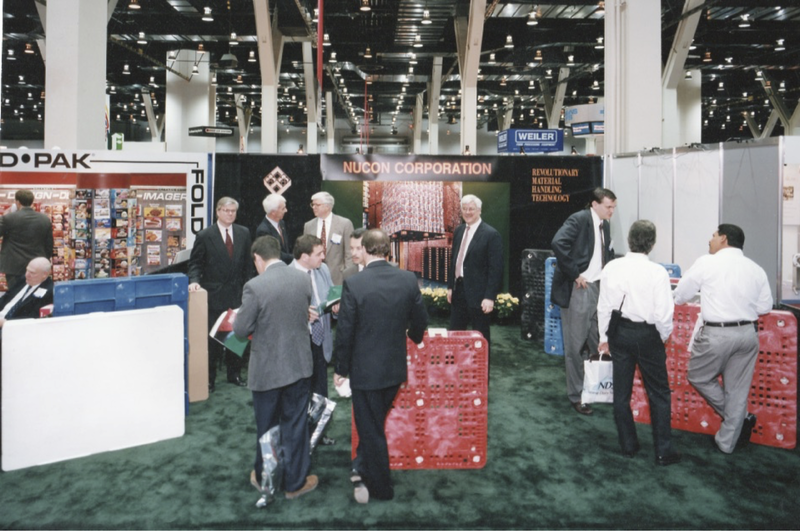 During the early nineties, Nucon utilized custom molders to run their pallet molds. However, the lack of control over the production schedule led to problems with customers. Nucon appealed to Wisconsin Governor Tommy Thompson and the state of Wisconsin to help build a state of the art facility in Pleasant Prairie that would be mutually beneficial. In exchange for the promise of tax revenue and jobs, the state of Wisconsin provided industrial grants, while the remainder was financed by Johnson Bank in Kenosha. Governor Thompson attended the plant's groundbreaking ceremony. 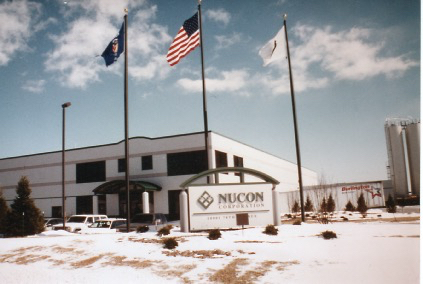 In 1995, the Nucon plant opened. Nucon had a sizable customer base in Europe, especially in the UK. Rexam was their top customer. In order to minimize the cost of transatlantic shipping, Nucon needed a manufacturing base in Europe. They found a partner in Ypres, Belgium based IPS. Through a joint venture, IPS/Nucon produced 44x56 can pallets for the European market. 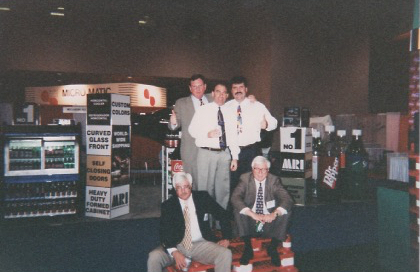 By the turn of the millennium, Nucon had seen tremendous growth and was the clear choice in the coveted beverage markets. Before long, they became an acquisition target. Menasha owned Orbis Corporation, a competitor of Nucon, submitted a bid in late 2000. Nucon was officially sold to Orbis in February of 2001. The Pigott family stayed on for a couple years to help in the transition and then resigned to explore other pursuits. Upon Pete Pigott's retirement from Orbis, he happened to mention to his son, Brian Pigott, that new international regulations (later known as ISPM-15 requlations) would soon be enacted. The forthcoming requirements would require wood export pallets to be either heat-treated or fumigated. This gave Brian a great idea. It didn’t take much convincing as he was certain that many businesses would pay a small premium for plastic pallets in order to avoid the documentation hassles that ISPM-15 created for wood pallet shipments. Brian left resigned from his 5 year career as a Motorola mechanical engineer. And almost overight, One Way Solutions was born. With a small office in Northfield, Ilinois, a low tech website, and a master distribution agreement with one plastic pallet molding facility, the pieces were fell quickly in place to serve the emerging needs of the material handling industry. Andy Pigott, Brian’s younger brother, came on board as Sales Manager in 2004. With Andy leading the sales efforts, One Way quickly gained traction with its focused offering and dedication to customer satisfaction, adding customers and garnering repeat business from loyal customers that still remain at the growing core of their current sales. One Way posted triple digit growth for the next several years and added more than a dozen pallet molding facilities to diversify their product offering. Export pallet business was healthy, but in order to see further growth, returnable plastic pallets were added to the product offering. One Way also designed and developed their own pallet molds when they saw an underserved application. After some highly publicized contamination issues, the pharmaceutical industry started purchasing plastic “FDA” pallets. The virgin material plastic pallets are considerably more expensive than their recycled material counterparts. The virgin material ensures that no contaminants can be introduced to their product or facility. One Way Solutions has sold plastic pallets to every major pharmaceutical company worldwide. With the coming FSMA requirements, they expect pharma to continue to grow as well as the food industry, which will be adopting the new sanitary requirements. In addition to offering plastic pallets, One Way Solutions also sells plastic bulk bins, presswood pallets, beverage boxes, and will soon be offering pallet inverters and flippers. However, our long history and experience with plastic pallets ensures that it will remain the core of our business for years to come. One Way Solutions is here to serve - check out our video that details our services and dedication to making sure you receive the perfect plastic pallet at the right price.